TierraCast Niobium hypo allergenic earwires. Brass Oxide. 20 gauge wire. Smooth deburred ends. Approximate measurements from top to bottom: 20mm. Sold in packs of 6 (3 pair). 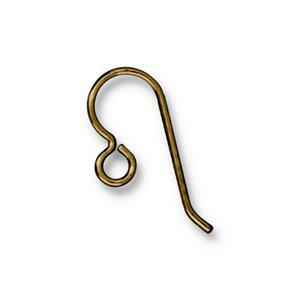 This ear wire has a gold tone to it, so you can use it with gold, antique gold and brass. Niobium is an inert metal that has a wide variety of uses including space engineering, medical transplants and hypo allergenic jewelry findings.